LOS ANGELES - March 4, 2014 - PRLog -- We’re proud to announce that web-renowned musician Emily Richards is releasing her twelfth record today, Open Soul, more than ten years since her last album release of new material under her given name. Alas, this digital-diva has been extraordinarily prolific in a period of misperceived silence. Under her pseudonym Snowflake, Richards has composed and shared over one hundred new songs at ccMixter.org and produced 10 new albums for that community since 2006. Her passionate vocals, universally captivating lyrics, breathtaking piano work, and flawless recordings have inspired producers of ccMixter alone to remix her songs over fourteen-hundred times. Due to the liberal nature of the Creative Commons licenses she’s attached to her compositions, permutations of her songs are featured in exponentially more YouTube videos, Soundcloud remixes and DJ releases. Coming full circle after nearly two decades of sharing her music, Richards and her team have curated a selection of her original tracks to create an intimate acoustic double album. Open Soul and Open Heart share her personal and spiritual journey over the past eight years. ArtisTech Media is delighted to release the first album of this collection, Open Soul, on the TuneTrack fansite today. Emily Richards is a singer, songwriter, pianist, activist, and entrepreneur with twelve albums under her given name and over 3 million unique downloads of her songs. Known internationally as a digital music pioneer, she was the most downloaded pop/rock artist on MP3.com and is now leading an entirely new kind of digital music revolution as the artist Snowflake on ccMixter.org. Richards is co-founder and CEO of ArtisTech Media, the company that operates ccMixter.org and TuneTrack.net. From the first note, Open Soul is an impassioned call to arms. Each song encourages growth, change, peace, and possibility. Emily Richards presents her vision for the world from a personal plane of experience and understanding. The stripped-down arrangements allow the depths of Richards' heart and soul to shine through. "My songs show the deepest and most personal parts of me," commented Richards. "I'm blessed to share much of these experiences with my fellow artists at ccMixter. They have buoyed me up and helped me develop every aspect of myself. I am grateful." Open Soul consists of 15 songs penned and recorded by Richards. Two of the tracks, "Open" and "Goodbye Shadow," feature the gorgeous cello work of Berlin-native Wolf Sebastian with string arrangements by Los Angeles-based composer Bevan Manson. All of the tracks were mastered by producer Brad Stanfield. The original paintings and artwork for Open Soul have been graciously contributed by Ken Tesoriere. "I listened to these heartfelt songs as Emily shared them on ccMixter," reflects Kara Square, ccMixer.org administrator and TuneTrack.net artist. "Each one sparked an influx of creativity in the community. Emily does that as a songwriter and a person. She inspires people to do beautiful things. Listening to Open Soul makes me feel fully engaged in her truth. And it gives me hope." ArtisTech Media, the company that operates ccMixter.org, is creating partnerships with artists, signing non-exclusive contracts, and releasing site content under Attribution-NonCommercial-ShareAlike Creative Commons licenses, thereby allowing listeners to share the gift of music – without being criminalized. Creative Commons licenses give musicians freedom to collaborate with other artists, and give fans the opportunity to interact with the music. 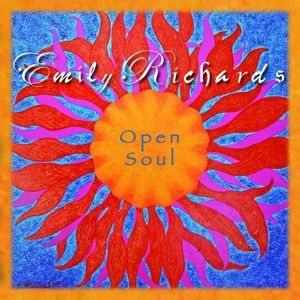 To support Emily Richards' music, join her Green Room at http://tunetrack.net/emilyrichards/join/ -- members receive immediate CD-quality download of Open Soul with high-resolution artbook. Green Room members enjoy a behind-the-scenes experience with private blog posts. Open Soul is shared under CC BY NC license, allowing free sharing for non-commercial purposes with Attribution. ArtisTech Media is a next generation music label that pairs music with technology in the best quality ways - in order to create a richer musical experience for both creator and listener. ArtisTech Media operates the sites ccMixter.org and TuneTrack.net.